This document is intended to serve as a model set of guiding principles for the ideal practice of veterinary physical rehabilitative medicine. This model has been developed by the board of directors of the American Association of Rehabilitation Veterinarians in collaboration with the American Physical Therapy Association Animal Rehabilitation Special Interest Group. Veterinary rehabilitation and physical medicine is defined as the treatment of physical injury or illness in an animal to decrease pain and restore function. A physical rehabilitation veterinarian treats muscle, tendon, ligament, nerve, bone, and joint injuries and uses physical medicine to restore maximal function and relieve pain, akin to the Physiatrist in human medicine. 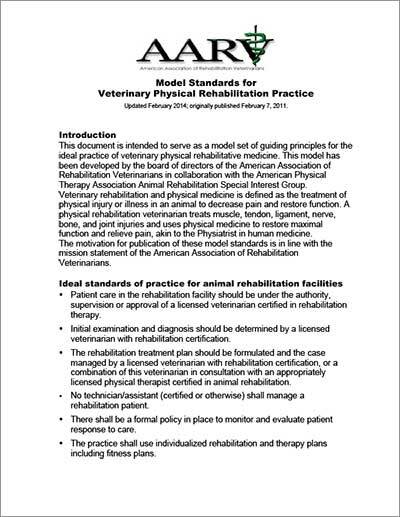 The motivation for publication of these model standards is in line with the mission statement of the American Association of Rehabilitation Veterinarians. Model Standards for Veterinary Physical Rehabilitation Practice (PDF format), updated February 2014; originally published February 7, 2011.